The largest river cleanup in America is back and WOW does it accomplish amazing benefits for our city of Angels. There’s a new important podcast in town, it’s live, and it’s dedicated to women’s health + 40. Welcome “Pause Podcast”! Books, books and more books and over 500 authors at “The LA Festival of Books” this weekend. A special Art Gallery with a wonderful exhibit, “I Am Nature” Tomatoes should know about. It’s also Bungalow Heaven time! Yahoo! And…the next Three Tomato LA Event “Annual Hats & Flats Garden Party” is scheduled for Sunday June 2nd. So…Save the Date… Ladies. More info to follow. 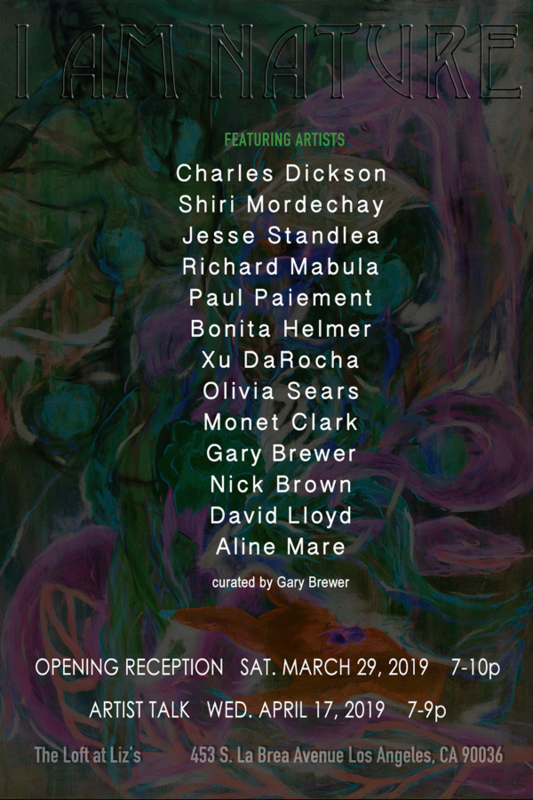 The Loft at Liz’s Art Gallery is hosting a fascinating exhibit “I Am Nature” with an Artist Talk on April 17th. This exhibit is inspired by a meeting between Jackson Pollock and Hans Hoffman at Pollocks Studio. After looking at Pollocks paintings, Krasner said, “You do not work from nature. This is no good, you will repeat yourself. You work by heart, not from nature.” Pollock answered: “I am nature”. Does that peak your interest Tomatoes?! Now what does that mean for artists working today? It was a different world in Pollocks’ day, so this exhibit explores the realities of the world we live in now and the philosophical implications of what these words mean to artists in the 21st century. This exhibition is a look through the lens of what “I am nature” means to a group of contemporary artists working today. The Loft at Liz’s Art Gallery, with its NY style loft space, has become a creative hot spot in LA and features both emerging and established artists and artisans from around the world and embraces works of all mediums. It’s a gem Tomatoes. Check out the “I Am Nature” exhibit, the exhibit talk and the cool art gallery. It’s a brilliant new endeavor that I feel ALL LA women should check out. Creator, Producer & Host Deborah Pardes and Producer Alicia Sedwick, two beautiful Tomato dynamos, have launched the monthly “Pause Podcast” recorded in front of a live participating audience in LA. 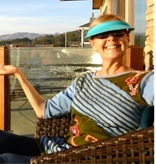 A podcast entirely focused on Women’s Health 40+! “Our Minds on Menopause” is next up Tomatoes! Woo Hoo! 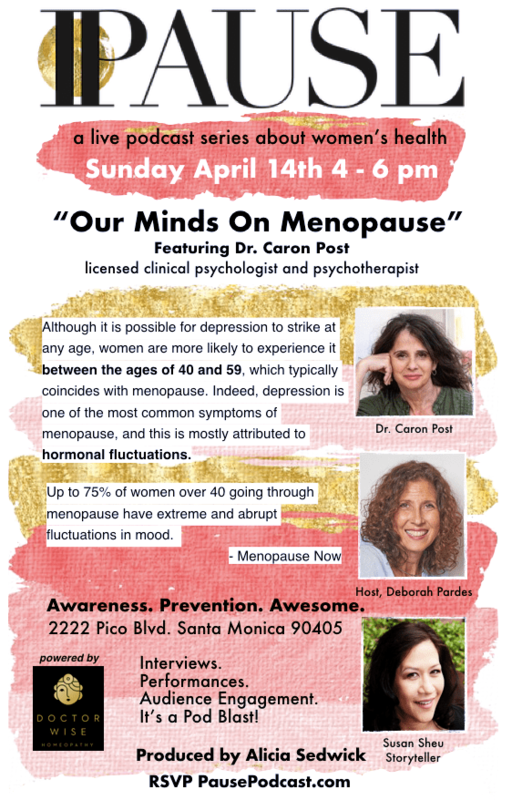 “Our Minds on Menopause” April 14th, with guest expert Dr. Caron Post, , will feature an in-depth compassionate look at what happens to women’s minds before and during menopause and how women can mitigate depression, anxiety, brain fog, and all the other lovely treats that come with life after 40. Attending a Pause Podcast is a great start. If you cannot attend, no worries Tomatoes, you can listen in after. 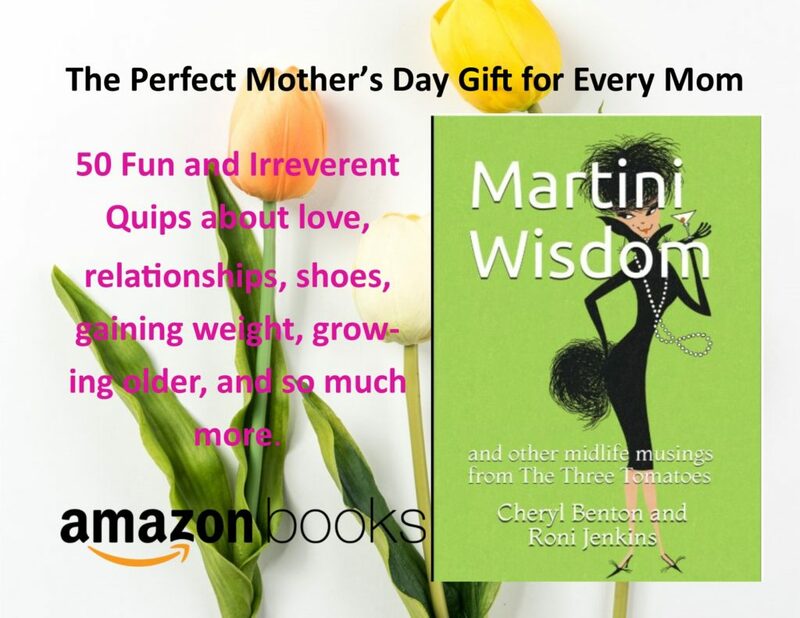 Bringing more focus and information on the health and well-being of women 40 + with a focus on thriving through menopause is vitally important. The medical community is still sadly lacking in this area so “Pause Podcast” brings more awareness to women’s health and menopause as well as educating women who may not always get their questions answered by their physicians. After listening to their first two inaugural podcasts , I am amazed by all that I have learned…certainly more than I have from my doctor. The Q & A conversations between the experts, the host and the audience guests are open, honest, spirited and comfortably frank and I found that so refreshing and inspiring. Do yourself a favor by attending or listening in Tomatoes. 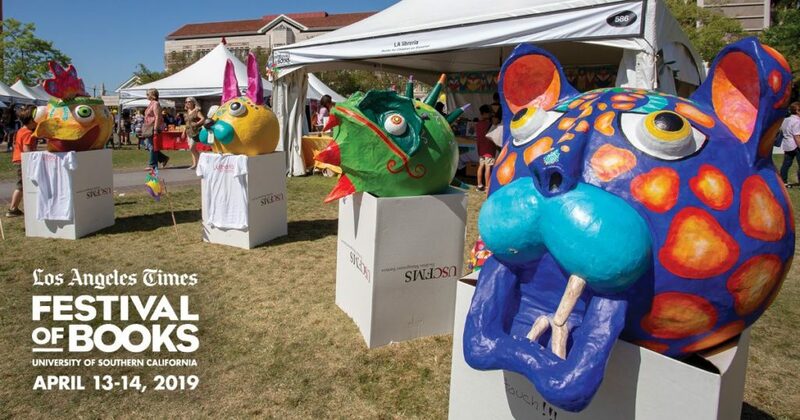 Since 1996, “The LA Times Festival of Books” gathers writers, poets, artists, filmmakers, musicians and emerging storytellers at what is now considered the largest event of its kind in the US. So, it is inevitable that inspiration soars at The Festival of Books. Each spring book lovers flock to this annual 2-day event and I suggest you do too, Tomatoes. Yep, books are the name of the game with lectures, signings and performances as well as art installations and culinary demos. 600+ authors from the likes of Chelsea Clinton, Dave Barry, Valerie Jarrett, Roxane Gay, Sean Hayes, Justine Bateman and “Queer Eye” star Karamo Brown will be there Tomatoes. Holy Cow! The variety and quality of talent present is legendary. It’s all about celebrating literary culture and the Los Angeles Times’ passion for story. Even the kiddos and grand kiddos will love it Tomatoes. For 30 years, FoLAR, Friends of the Los Angeles River, and Angelenos have cleaned the Los Angeles River and protected our oceans from trash and refuse. The government can’t handle it all Tomatoes, so FoLAR steps up to the plate, as always, to be a friend to the river with “The Great Los Angeles River Cleanup”. A super duper way to celebrate Earth Month Tomatoes. In 2018 they mobilized over 10,000 volunteers to remove 100 tons of trash. 2019 promises to be even bigger. 9 sites, 3 days and one river. Pick your site, do good, get a workout and SIGN UP to participate in the 30th annual Clean Up as FoLAR takes on 11 sites this year including the newly named Lewis MacAdams Riverfront Park. 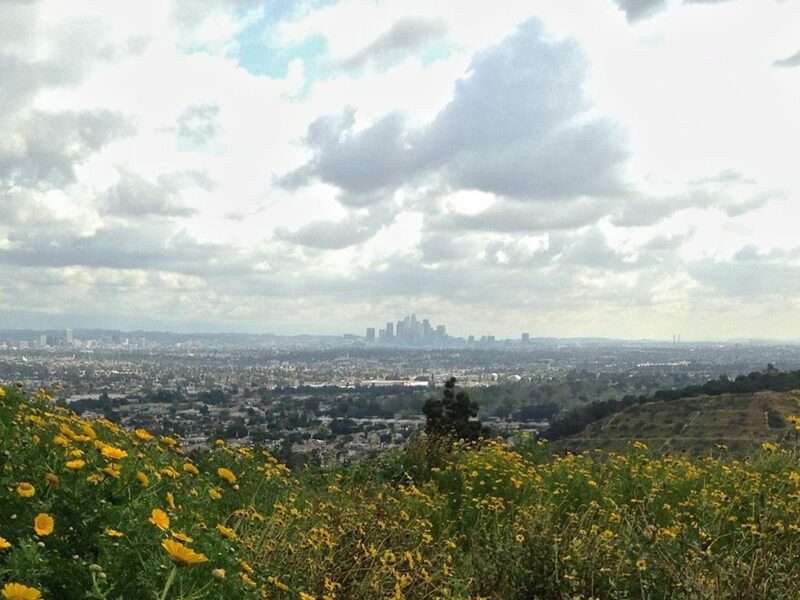 In 1990 FOLAR (Friends of the Los Angeles River) hosted their first river cleanup and the LA River has blossomed and will continue to blossom as a recreational and beautiful waterway. It has gone from 30 volunteers at the first cleanup to 9,000 in 2016 who picked more than 70 tons of trash in total. This clean-up is vital to the overall health of the river. “The Great LA River Cleanup” not only benefits the river but it also provides a chance for LA tomatoes to get to know the river. You’ll feel good after and, of course, the river will too. 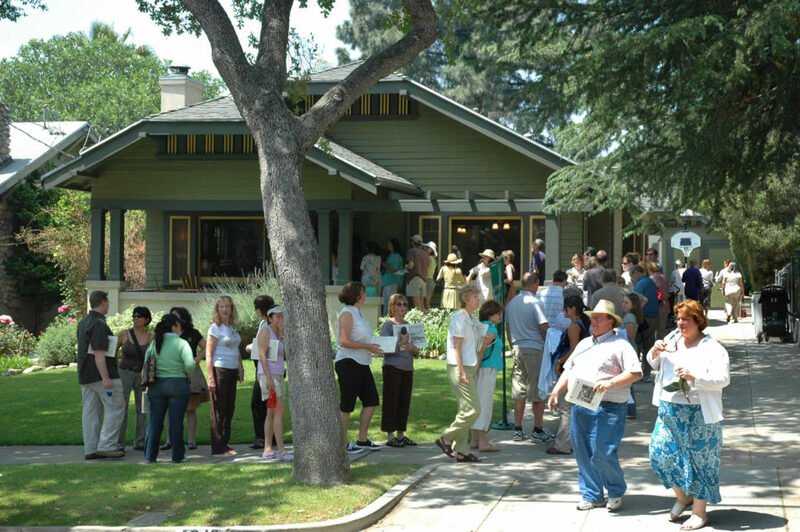 The “Bungalow Heaven Tour” is just that…Heaven…Historic and…Pasadena’s first landmark district. This dreamy neighborhood is perfect for strolling and you can stroll to your hearts delight experiencing one of the largest collections of Craftsman homes built anywhere in the country. If you are in to quaint and charming, like me, then this is the place to be Tomatoes! During your self-guided tour tomatoes, you will also get the opportunity to visit the interiors of several homes with the help of docents and docent led commentaries. I’m worried it sell out so I’m mentioning this early, so get your tickets now Ladies if you want to attend. You’ll also be treated to refreshments, food trucks for lunch and demonstrations of restoration work. If you tire of strolling ladies or want to know more, simply hop on the Bungalow Heaven Trolley for a narrated bus tour of the area. Enjoying a piece of paradise is a lovely way to spend a Sunday Tomatoes. Remember it’s Heaven but you get to come back.